What are Your Odds of Getting Approved for a Credit Card? 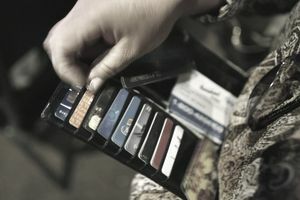 Whether you are a seasoned credit card holder or you’re applying for a credit card for the first time, you need to carefully consider what credit card you should apply for and how to increase your odds of getting approved for that credit card. Across the board, credit card applicants have an average approval rate of 39.1%. That estimate for your odds of approval is across all credit scores. Each of us has a different credit score. Credit cards are not created equally. They have different purposes. There are rewards cards, travel cards, balance transfer cards, and more. All appeal to customers who have varying needs and credit profiles. A credit profile is a summary of a person’s credit history. It's used by potential lenders, like credit card companies, to determine creditworthiness. It's also used by landlords and utility companies who are trying to determine your ability to pay your bills. Credit profiles also help determine your odds of getting approved for a credit card. Below are the five tips to consider when applying for a credit card. Don’t just grab every credit card application you can find and send them in. That will lower your credit card approval odds. You will be turned down for at least some of the cards which will hurt your credit score and your credit card approval odds. Make sure that there are no errors in your credit history. When a credit card company looks at your credit history, you want everything to be absolutely accurate. Look for any foreclosures or bankruptcies along with any judgments or collection accounts. If you have other credit cards, you should not carry a balance exceeding 30% of your credit limit. If there is an error on your credit history, file a dispute with the company immediately. You should have as little debt as possible on your credit history when applying for a credit card in order to increase your odds of approval. It is important to pay off all the long-term debt that you can. You can also minimize the appearance of short-term debt by paying off your balance before your statement closes. Your credit score reflects your credit history. After reviewing your credit history, you can purchase your credit score from FICO. FICO is the industry standard regarding credit scores. The Consumer Finance Protection Bureau published a study regarding odds of approval for a credit card based on credit score. According to that study, if you have a superior FICO score, above 720, you have odds of approval of 85.5%. If you have a prime FICO score, between 660-719, your odds of approval are 58.1%. If you have a subprime FICO score, 659 or lower, then you have odds of approval of only 17.1%. These odds of approval are not guarantees of approval, but possibilities of approval. Most credit card companies ask for annual net income on a credit card application. Annual net income and credit score are equally important when applying for a credit card. The income requirement is important to the credit card company because it indicates your ability to meet your monthly debt obligations. If you have other sources of income, you don’t have to just list your net salary or net hourly wages. You can also include investment income, spousal support, royalty income, and any other income you might receive in order to make it obvious you can pay your debts. You may be asked to produce pay stubs and other documentation to prove your claims of income. Decide your goal in applying for a credit card and make sure it fits your credit profile. For example, if you are a student working at a part-time minimum wage job and going to college, you might not be able to get approved for a travel card. Read through all the credit card application material and be sure that your credit score matches their requirements along with your income level. The closer your profile matches the credit card requirements, the more likely you will be approved. Tip: If you are not approved for the credit card, don’t give up. You can raise your odds of getting approved for a credit card by working to raise your credit score and building up your credit history along with your annual net income. Be sure you have chosen the right type of credit card.